As Quebec spends its money on language police and fighting court challenges that clearly violate the charter of rights and freedoms it seems that it has forgotten that if you do no maintenance on your bridges, roads, buildings, overpasses, highways and sewers, there will be nothing left standing to fight about. Montreal, Quebec, Canada is a prime example of what I am talking about. 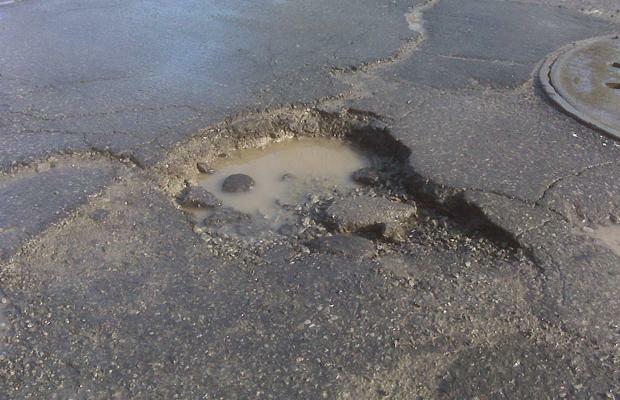 The city of Montreal says it spends $21-million every year on road repairs and maintenance, and this includes the cost of fixing those annoying potholes. Montreal decided long ago that it would not fix its street properly and to make sure that they could not be sued by drivers for damage done to their cars the city passed laws that made it virtually impossible to claim for damage due to potholes and other defects in the roads. This it seems was only the tip of the iceberg and like most icebergs what you see above the surface is nothing compared to what is below and out of sight. This was avoidable, but instead things like this are happening or in danger of happening all over Montreal and surrounding locations. Warned for over 10 years that the overpasses were going to start crumbling, falling apart and that they posed a danger and a safety hazard that could result in deaths and injury to drivers and pedestrians alike the governments of Montreal , Quebec and Ottawa denied they had a problem and stated over and over again that Montrealers and visitors to our city had nothing to worry about and that the overpasses were safe. 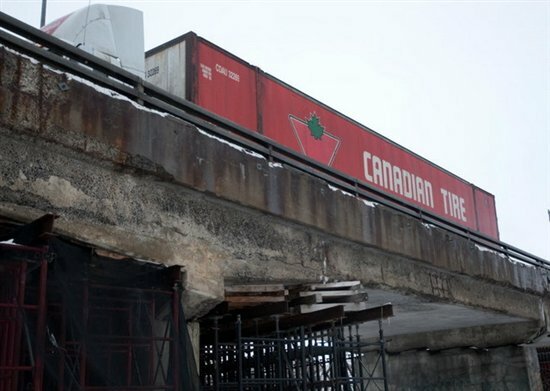 That all came to an end though when emergency crews began removing small sections of a collapsed overpass in Laval, Que. Three vehicles and a motorcycle fell about 15 metres on to Highway 19 from Boulevard de la Concorde after three lanes of the overpass gave way. 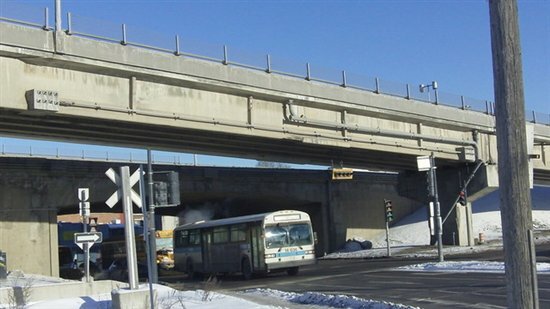 Transport Quebec spokeswoman Josée Seguin told the Canadian Press at the time, that the overpass was built-in 1970, but she didn’t know when it was last inspected. 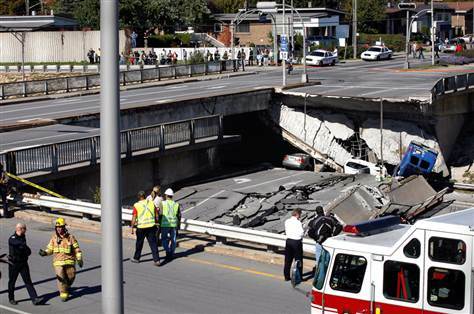 She said the department heard about an hour before the accident that pieces of concrete were falling off the overpass. The report goes on to say that the collapse is not the first in the Laval area. 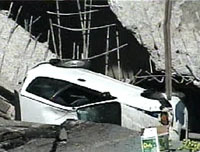 In 2000, a large segment of an overpass on Highway 15 collapsed, killing one motorist instantly and trapping two others for several hours. Nothing wrong with the overpasses leading onto the Mercier? Despite all of the construction and all of the scaffolding and metal netting being bolted to the overpasses the governments of Canada still maintain that Montrealers have nothing to fear. it has been a long-standing joke that really isn’t funny at all that says,”you know when you are driving in Quebec because of the bad state of our roads, streets and highways.” Now we have bridges literally ready to collapse and the governments of Canada have decided to ignore an engineering report that states that the Champlain Bridge will most likely collapse in the near future and that repairs are futile and a new bridge needs to be built. The report says clearly that all money spent to repair the bridge is wasted money, yet the governments have decided that repairing the bridge is the best option while it conducts more studies. The Mercier Bridge is in such a dilapidated state and so dangerous that trucks can no longer cross on the side leading out of Montreal and traffic has been reduced to single file. I agree with a statement I read in the Canadian Press, made by the coroner back when the Laval overpass collapsed, DeCaprio said, “I don’t know what’s happening in our city”. Léa Guilbeault, shown with Hani Beitinjaneh, was killed in July 2009 when a chunk of concrete crashed down on her while the couple dined in a sushi restaurant. 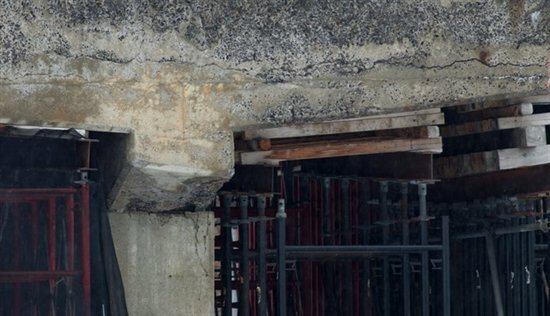 Coroner blamed lax regulations for deadly falling concrete. This is not the only building that is a danger to all that venture near it. This senseless death brings into question how come we have enough money for some inspectors and not others? Why does Quebec have the have political will to see that regulations are followed for things that do not cause death, or injury, but does not for safety issues. The sad fact is that this death happened because the government does not do its job and inspect the buildings like they are supposed to. People are dying in these cases because Quebec is not enforcing the safety code and the law, with the same vigor that they go after Muslims wearing religious head wear, closing English schools and making sure that the lettering on advertisement is smaller in English than it is in French. When how to proceed changing your sewer system becomes such a problem that you due to neglect you are afraid to even touch it because you do not know where or what damage you will cause or if it could be catastrophic I would say that some one screwed up. All over Montreal sewers are backing up stinking up the city, pipes are bursting underground and causing major disruptions above ground and the governments of Canada do nothing. there have been so many scandals and accusations flying bout and so little work being done that Montrealers can be found constantly under boil water restriction before drinking in one part of the city at any given time. We have cute phrases like it is an acceptable percentage rate of toxins in the water. What does that mean exactly? Does it mean I will not get cancer fast it will come on slowly? Ask anyone living in the borough of Verdun how acceptable it is. In Lasalle the city gives out a special soap to wash your clothes in at least once a year because our water dyes our washing red, like rust. Why are we paying taxes when nothing gets done before some one gets hurt or dead and maybe not even then? I think what gets to me the most is that this is all avoidable; the deaths, injury and the sorrow to these peoples families, if only the governments of Canada would give a damn. The only thing that all of the governments of Canada, bar none, are concerned about is who is to blame, how cheap can it be fixed, or can we hide the problem until we are out of office and politics. Right now we have to ride our bridges at your own risk; the new way of commuting in Montreal. I guess they made it at your own risk, so that when the bridge finally does collapse and kill God knows how many people the government will have given out its disclaimer and to their way of thinking can not be held legally responsible. If these bridges were not the only links to getting on and off the island of Montreal and to the South Shore of the Island used by thousands of commuters daily this might even be a great comedy act. This situation in Montreal is not the blame of the current administration or the current governments, nothing of importance in the infrastructure of this city has happened since the 60’s, that wasn’t a photo opt and lives are being lost because of it. This is what happens when a municipal government is held hostage by a provincial government who has decided to put the goal of separation from Canada above all other things and the federal government does nothing. This entry was posted in abuse, abuse of power, Canada, Government, The work force, Uncategorized and tagged Canada, Champlain Bridge Montreal, Conservatives, Gilles Duceppe, Highway, Honoré Mercier Bridge, infrastructure, Laval, Laval Quebec, Maintenance repair and operations, Montreal, Quebec, Stephen Harper, Technology. Bookmark the permalink. Thank you Vic have you told this to the powers that be? Man go to it, whatever works and again thank you very much!!! Would you mind if I send this to the government ? Have a great day! Good article, but I think that this phenomenon extends far beyond Québec. Maintaining public infrastructure is getting increasingly difficult across the country. The municipalities, having to deal with the “download” of powers and competencies from the federation-to-the-provinces-to-them-cause-the-provinces-are-lazy-bastards are shouldering a public services load to heavy for them and are going broke. Winnipeg, a city about the size of London, Great Britain & Northern Ireland, in area has only 1/10th its population, so maintaining the public infrastructure is a heavy burden for any jurisdiction. That the roads of Winnipeg look worse every year is not surprising. Québec is probably the worst case only because the separatists want as much provincial power as possible (and eventual independence), so I bet that Québécois municipalities are shouldering an ungodly burden and probably are going broke the quickest. But I would not doubt that this problem is country wide. You are right and of course all of that makes sense, but it is a rotten shame that people have to die while politicians do what they do best, screw us around. Just thought I would bring it up since we are in this election mode and everyone will put on their rose colored glasses and vote for the biggest, most believable liar out there and cry fowl the day after the election. I think that all governments seem to have their priorities out of whack. Have a great night! !